Mumbai, May 27, 2013: It was truly a golden jubilee moment in Indian film industry as several film personalities and celebrities attended the virtual premiere of actor-director Sachin Pilgaonkar’s new film ‘Ekulti Ek’ starring his debutante daughter Shriya at Mumbai’s historic Citylight theatre near Shivaji Park marking the completion of his 50 years in the world of films. Coupled with the actors Sachin, Shriya, Supriya Pilgaonkar and Ashok Saraf, some of the luminaries seen at the virtual premiere included the grand old lady of cinema – Sulochana, Kiran Shantaram, Renuka Shahane, Ashutosh Rana, Sumeet Raghavan, Nishikant Kamat, Satish Shah and Nivedita Saraf. The packed house at Citylight theatre also included several friends, associates and relatives of Sachin and Supriya Pilgaonkar. Based on the sensitive theme of father-daughter relationship, Ekulti Ek is an entertainer to be shown throughout the state from Friday, 24th May. With actor Sachin Pilgaonkar completing 50 years of his illustrious film career, he offered a golden jubilee treat to his fans by showcasing the special virtual interactive premiere of his new film ‘Ekulti Ek’ starring his daughter, Shriya. Sachin’s first film to have a virtual premiere was shown to viewers in UFO digital theatres located in the State – Mumbai, Thane, Nashik and Aurangabad –at the same time. Producer-Director-Actor Sachin took the significant step of inviting the masses to a virtual premiere show of his new film ‘Ekulti Ek’ and it was a grand success and milestone in Marathi cinema. Citylight in Mahim, Gold in Thane, Damodar in Nashik and Big Anjali in Aurangabad were the theatres selected for the virtual premiere show, held on on 23rd May. Film-goers sitting in UFO Digital theatres at all these locations could see and interact ‘live’ with Sachin, his daughter Shriya and the versatile Ashok Saraf, who were seated at the UFO studio. The audiences included the father-daughter duos, who had won the special ‘Ekulti Ek’ marketing campaign in association with UFO Moviez, and had the special privilege of asking questions to Sachin & Shriya. Also, viewers at one location could see and hear those at another, while they interact with Sachin, Shriya and Ashok. No Hindi film producer has so far attempted such an initiative, pioneered now as part of the Marathi film ‘Ekulti Ek’. And this happened on the day exactly 50 years after his first film ‘Ha Maza Marg Ekala’ was released in the state. “I am glad that the virtual premier of ‘Ekulti Ek’ in many places across Maharashtra at the same time became a big success and a milestone in Marathi cinema. I was extremely happy to see many friends, relatives and associates at the premier and their positive reactions to the film and my daughter Shriya’s debut role made me quite emotional. I’m pleased that 50 years after my debut, I could leverage satellite digital technology to give ‘power to the audiences’, who made me so popular. 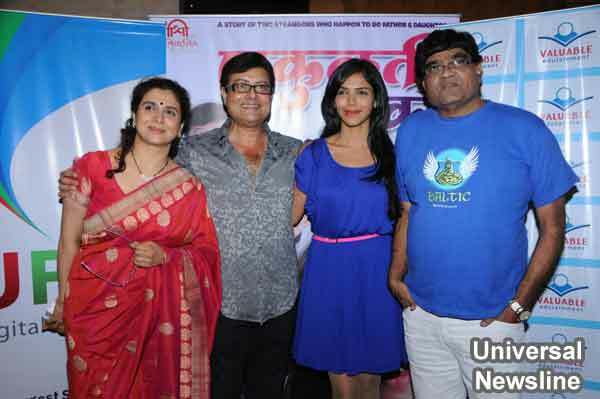 It is a great feeling that all these positives coincided with my daughter’s debut and my golden jubilee gift to the audiences ‘Ekulti Ek’,” said Sachin Pilgaonkar. UFO Moviez, the world’s largest satellite delivered digital cinema network, has revolutionized the way films are distributed and exhibited throughout India. Presently, UFO has a base of 3182 digital screens (including 124 3D screens), spread in over 1,300 cities in 28 states and 5 union territories of India. UFO has so far released 5,789 films in 30 languages and has conducted over 14.6 million shows till date. UFO Moviez is widely acknowledged for the impact of its satellite-based digital cinema technology solution, which enables movies to be transmitted first day-first show to millions in theatre complexes, including in tier 2 and tier 3 towns. UFO Moviez has been recognized as one of the fastest-growing companies in India, securing 39th rank among the Top 500 Companies, as listed by 'Inc. India 500' in 2012. Using satellite technology to transmit first day-first show movies to 3,000 plus network theatres, UFO Moviez India Ltd has bagged the prestigious Marico Innovation Foundation award (4th edition held in 2012) for Innovation in the Business category. UFO Moviez’s end-to-end digital cinema solutions encompassing content digitization, encoding, encryption, delivery and projection of content using digital technologyhas been awarded the ISO 27001:2005 certification by the British Standards Institute, earning the internationally accepted certification on information security from one of the world’s leading management systems registrars. It received the award for ‘Deloitte fastest growing 50 companies in Technology, Media & Telecom space’ in 2010. UFO Moviez won accolades in the following categories, at The Advertising Club Awards, Big Bang 2007, held in Bangalore: for Best Media Innovation- Cinema- GOLD; Best Media Innovation - Digital - GOLD; Best Media Innovation- Never before used Media- BRONZE.